This festive Chinese New Year, everyone is joining in the festive cheer with lots of auspicious feast and promotions for special giveaways. Sakae Sushi, one of Malaysia’s popular hotspots for Japanese cuisine, is also joining in the CNY cheer of bringing people together through good and healthy food whilst rewarding customers by offering exciting promotions. A recent invitation to Sakae Sushi’s Chinese New Year Treats and Yee Sang launch was attended by a list of local celebrities, members of the media and bloggers together with Hope Worldwide Malaysia as well. The weekend event started early in the morning with everyone gathering at Paradigm Mall. The event took off with a speech by Yew June, General Manager of Marketing for Sakae Sushi Malaysia. This year also marks a unique and meaningful CNY celebration as Sakae Sushi capped off its ‘Gift of Love’ campaign with a cheque presentation ceremony. The campaign, which was launched in conjunction with Sakae’s 17th anniversary last year, saw diners being invited to fold an origami heart and drop it off at the “Gift of Love” box placed in Sakae outlets nationwide. Each origami heart received would then be channeled as RM1 to be donated to Hope Worldwide Malaysia, enabling Sakae Sushi and its customers to play an active role together in supporting charity causes. To commemorate the campaign’s success, Sakae Sushi presented Hope worldwide Malaysia with a total of RM20,000 in donations at the event. The children from Hope Worldwide Malaysia presented a few songs at the event and there was a cheerleading performance as well for some festive cheer. Sakae Sushi’s mascot came dressed in festive CNY fashion to join the launch of Sakae Sushi’s Yee Sang launch. 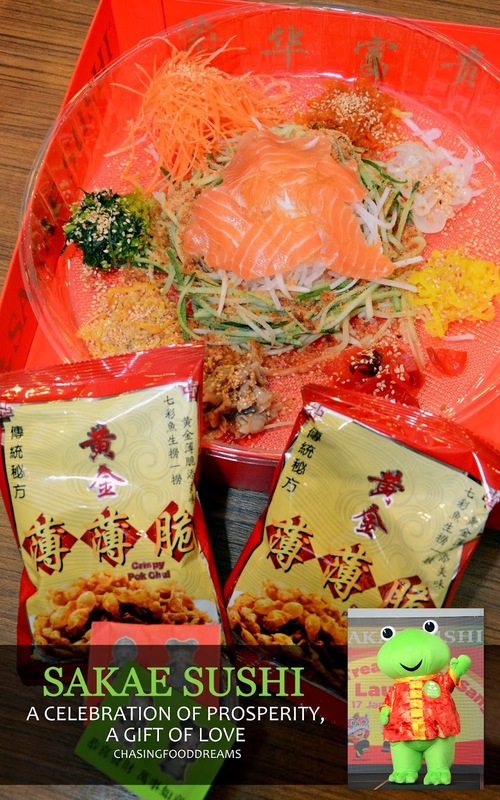 The chefs from Sakae Sushi presented the way to prepare Sakae Sushi’s Fortune Salmon Yee Sang. Then guest of honours together with the local celebrities and Sakae Sushi management team proceeded to launch of the festive Yee Sang with a Lou Hei toss! To cater for different occasions, the Fortune Salmon Yee Sang is available in two dining options themed Success (for 1-2 persons) and Money (for 6-8 persons). For added convenience, the Yee Sang comes in an exclusively designed premium packaging box ideal for takeaways, gatherings, corporate giveaways or gifts. Sakae Sushi’s Fortune Salmon Yee Sang uses thick slices of fresh airflown salmon accompanied with a variety of authentic Japanese ingredients such as seasoned jellyfish, scallop, seaweed, radish, sesame, and more. Sakae’s delectable yee sang is then topped with a unique and appetising citrus-infused sauce. We proceeded with a lunch at Sakae Sushi and toss our Fortune Salmon Yee Sang which was followed by signature dishes. Apart from bonding over great food and great company, diners can also expect auspicious rewards with Sakae’s CNY Treats. This comes in the form of the Lucky Bag Giveaway, where customers just Dine, Collect & Redeem an exclusive Lucky Bag. Through this promotion, customers receive a stamp for every RM30 spent at Sakae Sushi. Once they have collected 8 stamps, they can then redeem a FREE Lucky Bag consisting of a limited edition Sakae Fortune Froggie plush toy, a tote bag, genmaicha, cash vouchers and angpows totalling up to RM88. Alternatively, they can collect just 3 stamps and take home the Lucky Bag for only RM38.80.